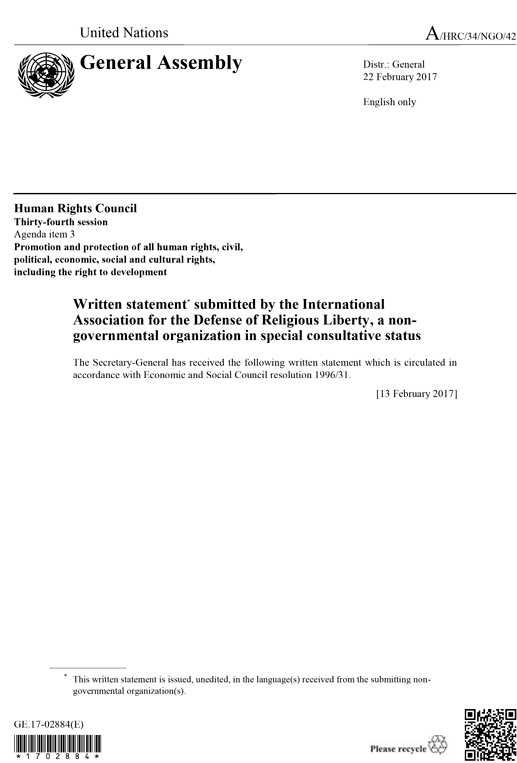 The following statement was issued by Dr Liviu Olteanu and has been introduced to the United Nations as a written statement on the 34th Session of the UN Human Rights Council regarding the Global Summit co-organized by the AIDLR and OGPRtP at the Palais des Nations in Geneva on 23-25 November 2016 The focus of the Summit was ‘Fostering freedom of religion and belief as a tool for fostering peace, security and human rights’. The Global Summit highlighted the importance of enhancing the synergy between stakeholders who play a fundamental role in fostering peace, security and human rights worldwide. These stakeholders are: Diplomats, Politicians, Religious Leaders, Academics and Civil Society (NGOs) representatives. The main objective of the Global Summit was to establish the International Platform on Religion, Peace and Security aimed at connecting the various stakeholders aforementioned, as well as enhancing their cooperation on matters related to peace, security and human rights. The Platform aims at supporting the 2030 Agenda for Sustainable Development Goals and in particular Goals 16 and 17, which call for “Peace, Justice and strong institutions”.